One of my favorite things ever is this pumpkin cake with cream cheese frosting, posted as pumpkin cupcakes here on my blog. SO GOOD. I hadn’t made it yet this fall and thought I’d try it with brown butter frosting. SO GOOD. Whichever icing you use and whether it’s a cake or cupcakes, this pumpkin cake recipe is the best of all the pumpkin cakes. I swear by it. People request it. Put down your computer and go make this now. NOW. Why are you still reading? Oh! The recipe. That’s why. Preheat oven to 350 degrees. Grease two 9-inch baking pans. Beat the pumpkin and sugar. Add in the oil, eggs, and vanilla. In a separate bowl, mix the flour and other dry ingredients. Add to the pumpkin mixture and beat until well incorporated. Stir in the chocolate chips by hand. Bake for 25 to 30 minutes until a toothpick comes out clean. Let cool before frosting. Melt the butter in a pan over medium heat, stirring frequently. It will begin to brown--I always smell it first. It will be foamy and bubbly and just turning brown when you want to remove it from heat. Let it cool, then use an electric mixer to combine the butter with the sugar, vanilla. Add milk as needed until you have the consistency you want. It should be thick enough that when you lift the beaters, it does not drip from them. Chocolate + pumpkin is the best combination. Peanut butter, don’t get jealous. Chocolate loves you, too. But during fall? You might feel a little lonely because chocolate and pumpkin will be having a love affair. Come back in January. Maybe February. Until then pumpkin and chocolate will have a Do Not Disturb sign hanging on their door. Okay? Okay. 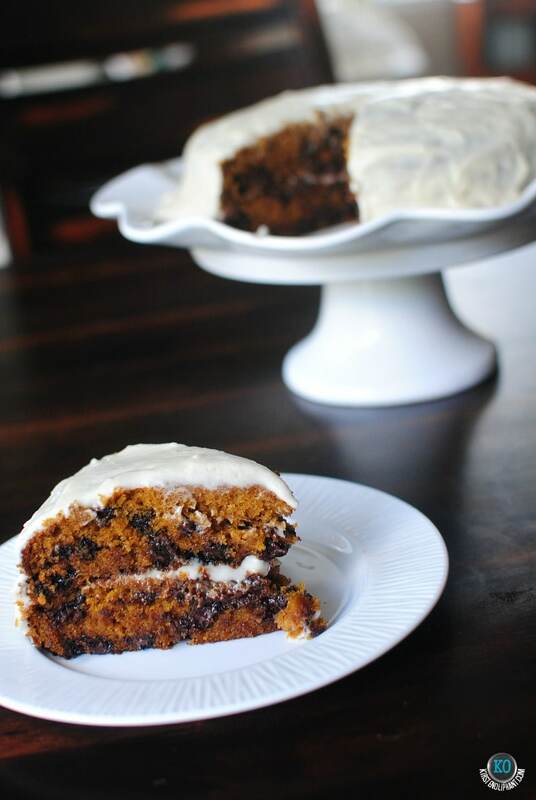 The real debate is whether this pumpkin cake is better with cream cheese frosting or browned butter frosting. I LOVE cream cheese frosting. It’s my go-to and will probably be my forever frosting. But shaking things up with browned butter? Tough competition. The thing I love most about browned butter is the smell in the air. It becomes rich-er and almost nutty. I wish they made a browned butter candle or scent cube for Scentsy. NOM. The kids also love it. My friend Jenna’s son requested this for his 6th birthday party last year. That’s huge! This morning Sawyer had this suggestion for me: “Mommy, you should put lasers around this cake so that if someone breaks in and tries to take it, the cake is protected by lasers and no one can eat it.” I’ll get RIGHT on that. I’m linking up with A Southern Fairytale’s Mouthwatering Mondays this week, where my Champagne Cupcakes were featured. Woot!! I’m also linking up with Foodie Fridays, a fab linkup where every link gets pinned. Are YOU a pumpkin and chocolate lover? What recipe do you go back to again and again every fall? If you like this, come check my collection of pumpkin recipes from the wide web over on Pinterest! There are some other great looking cakes and drinks over there. Yum! 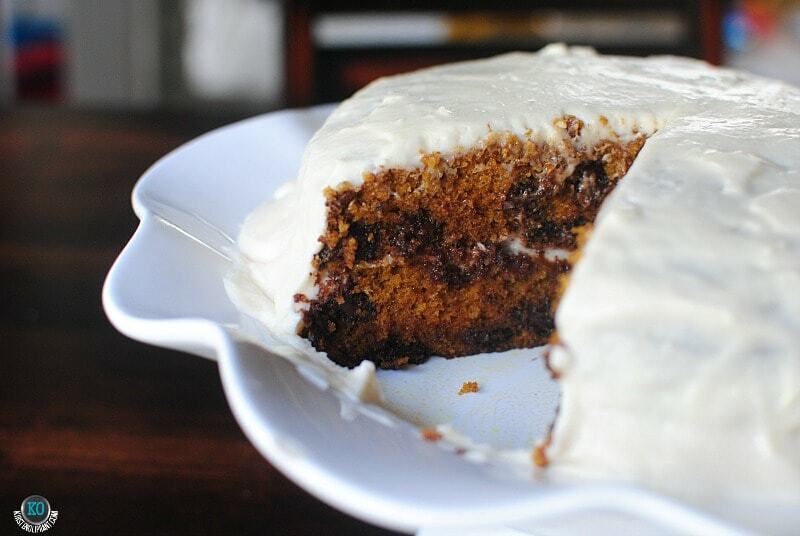 I adore pumpkin cake. 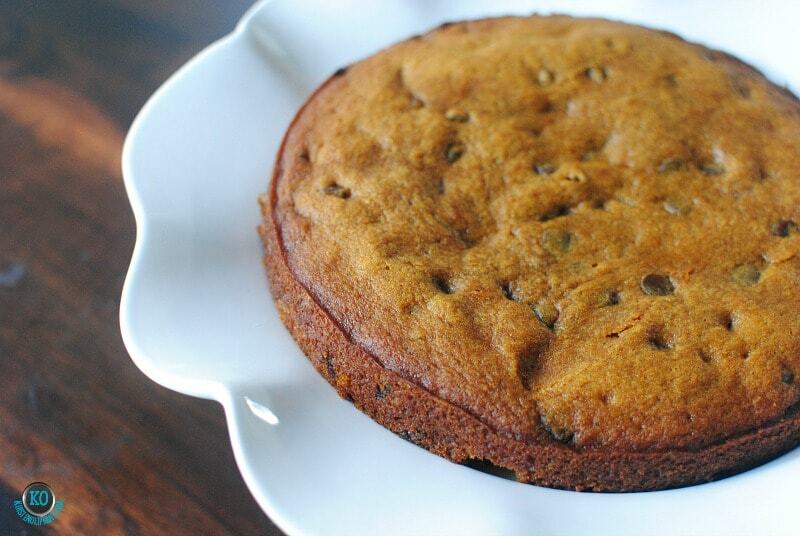 LOVE pumpkin cake, and anything browned butter… yes, please! This look A-MAY-Zing! Pumpkin rules! I make pumpkin chocolate chip muffins all the time. They are my stand-by, especially because they freeze so well! Sometimes I make the recipe as bread, sometimes as muffins or sometimes as mini-muffins. They are always good because you can’t go wrong with pumpkin and chocolate! 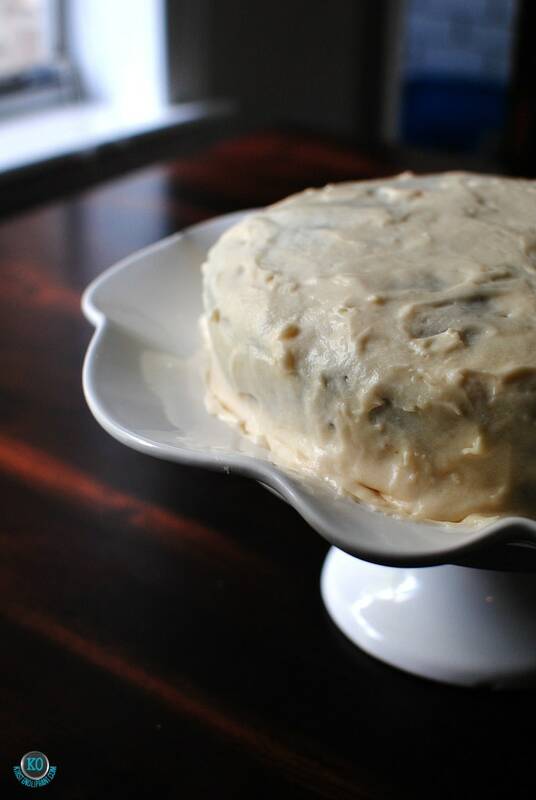 I’ve never made a brown butter frosting, but pinned this to try very soon! Yum! I think those sound great. I have a ton of pumpkin left and also some bananas and chocolate chips…I think a chocolate chip banana muffin might be in order. Made this this weekend and agree that it’s TO.DIE.FOR. I used 3 cups instead of 3 Tbsp. of powdered sugar for the frosting, though. It’s even better the second day, if it’s around that long! Thank you SO much for pointing out that typo! 3 Tbs would make for terrible frosting! lol. That looks SO good! 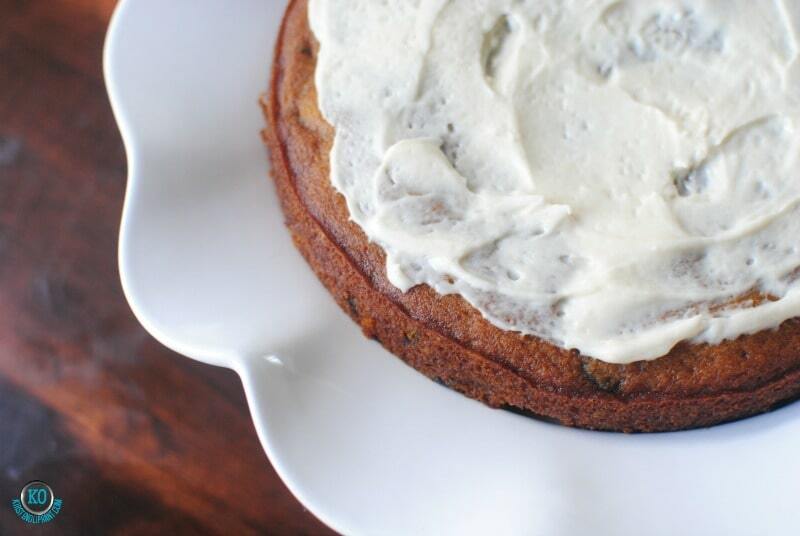 I love cream cheese frosting too, but you make brown butter frosting sound wonderful! Pinning and will be sharing your yummy recipe on my Facebook page tomorrow! Thanks for joining us at Foodie Fridays again this week! I think between the two, I’d prefer the cream cheese. BUT the brown butter? Oh my gosh. It really is insanely good. I am not a fan of pumpkin…But I am a little obsessed with your pictures! Thanks for linking with us at #Foodie Fridays! Hope you will join us again soon!